Organized by Zvi Bern, Lance Dixon, Michael Douglas, Alexander Goncharov, and Lionel Mason. The study of scattering amplitudes in relativistic quantum field theory has undergone a remarkable renaissance and transformation in recent years, with many remarkable and unexpected interactions with diverse areas of mathematics. This meeting aims to review progress in the geometry and physics of scattering amplitudes and to provide a concentration point for the fall program “Physics and Mathematics of Scattering Amplitudes”. Topics will include developments from the physics side on new perturbative approaches such as generalized unitarity, recursion relations, twistor variables and topological string theory, integrability methods and the OPE, color-kinematics duality and double-copy properties of supergravity theories. From the mathematics side, topics will include the (positive) Grassmanian and polytopes, (motivic) multiple zeta values, single-valued multiple (harmonic) polylogarithms, and the symbol of an iterated integral. These ideas have led to striking progress in both physics and mathematics and the time is ripe to take stock of progress and identify future directions. Some emphasis will be placed on problems in scattering amplitudes that might be solved with mathematical insights or tools, leading to new breakthroughs. This workshop is a part of the Fall 2013 program, Physics and Mathematics of Scattering Amplitudes, which is organized by Zvi Bern, Lance Dixon, Michael Douglas, Alexander Goncharov, and Lionel Mason. This program takes place for the duration of the Fall semester of 2013. *More information of the Food Physics Event on Tuesday, December 10th, can be seen here. 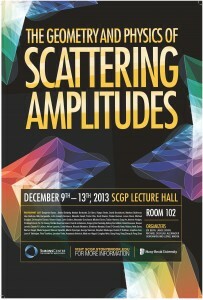 *The SCGP Weekly Talk will be held in the Simons Center Lecture Hall (Room 102) on Tuesday, December 10th, at 1pm. *Wednesday, December 11th, is a short day, with talks ending before lunch. Simons Center Congratulates Jim and Marilyn Simons on their receipt of the 2013 Andrew Carnegie Medal of Philanthropy.